Courgette creme soup (or zucchini creme soup) is something I had growing up. It's super delicious, wholesome and a very easy and inexpensive starter. The toasted almonds provide a delicious source of protein and complement this dish very well. It also works perfectly well as a light dinner when you add some wholemeal bread on the side. And this recipe is also super easy, it only takes about 15 minutes to make. I always love how some of the best dishes are actually the easiest ones. Courgettes are also always available and quite cheap. If you want to make this a main meal you can also boil a couple of potatoes in the soup and then blend. Serve this soup with an optional scoop of soy yoghurt, flaked almonds and some bread one the side. I don't know what it is about green food but I just love the vibrant colour! The toasted almonds go so well with this soup! My mouth is still watering as I write this! Toasting almonds is very easy, just heat up some oil in a pan, add the almonds, season with salt to taste and then wait until they turn golden brown. Chop up 500g of courgettes (also called zuchini in the states) - that's roughly 3 average size courgettes. And then finely dice 1 white onion. Sauté the onion in some olive oil until it softens. Then add 1 tsp of minced garlic and the chopped courgette. Then add 500ml of boiling water, 1 1/2 stock cubes (I find if you have real organic courgettes, 1 stock cube will do), pepper to taste and let cook until the courgettes have softened. You can also add 1 - 2 tbsp of lemon juice if you like. It will bring out the taste even more. In the meantime heat up some olive oil in a pan, add flaked almonds and season to taste with salt. Toast the almonds on high to medium heat until they are golden brown. Stir them all the time and be careful that they don't burn. When the courgettes are cooked either puree them with a hand blender or pour the soup into a heat resistant kitchen blender and blend until smooth. Serve the soup with a scoop of soy yoghurt (or any vegan yoghurt, like the coconut variety) and the flaked almonds. Enjoy! 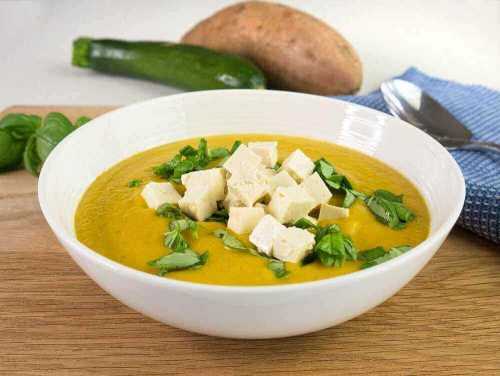 And if you like soups, then also try my sweet potato and courgette soup with ginger and basil.